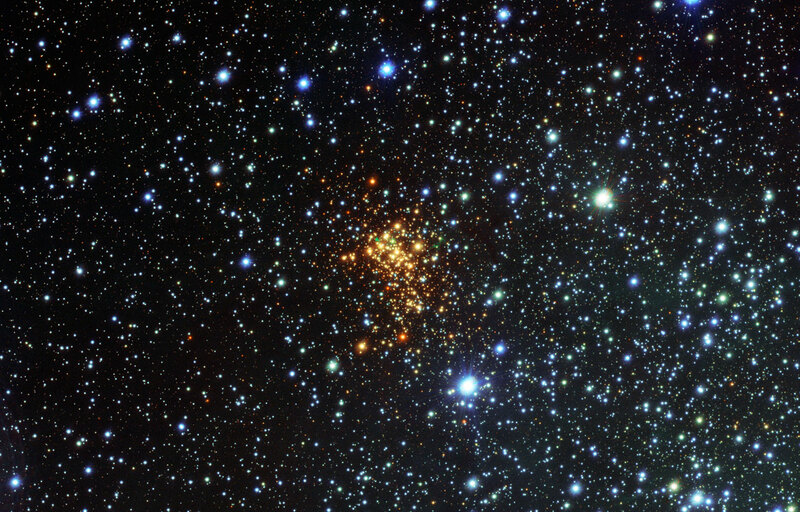 A star called W26 located in a supercluster called Westerlund 1. W26 is located in our very own Milky Way and is considered a red supergiant and is 1,500 times bigger than our own sun! Just to humor you and try and give you some perspective think about this. Our Earth has a diameter of 12,742 km. Our sun has a diameter of 1,392,684 km and when we compare that to W26 it has a staggering diameter of 2,089,026,000 km! If W26 was placed in our solar system it would reach out to 13.9 AU (astronomical units – distance from sun to the Earth) which would be further out than Jupiter. That would mean every planet including Jupiter would be sitting inside W26! Now something interesting happened to W26 as astronomers were observing it using the VLT (Very Large Telescope) in Chile. Look at the photo above and take a closer look at the cluster of stars towards the middle of the image. W26 is in that cluster believe it or not and they saw a huge cloud of growing hydrogen gas around the star. You can even see that in the cluster if you can spot the green dot in the cluster of stars. These glowing gasses mean that they are ionized and what that tells you is that electrons have been stripped away from the atoms of hydrogen gas. It’s actually rare to even find ionized gas around massive stars let alone red supergiants like W26. This actually marks the first time they have ever observed such a thing. Massive stars don’t live very long so it can be hard to observe them before they rip themselves apart. Our own star will last for billions of years (About 10+ billion) to come and a little easier observe. Since the gas is ionized it will make it easier for the astronomers to see and analyze the red supergiant star. W26 will have a fantastic ending as its life will be ending and finish off with a supernova. It’ll be interesting to see what other data will come from this star but it does make you wish to see one of the largest stars known in the universe to go supernova. It certainly would be extraordinary and possibly have some heavy consequences on nearby stars and planets. Just having a star like that in the local neighborhood would be an impressive sight, but wouldn’t want to be too close. Wonder how many otherwise habitable worlds have been destroyed due to local stars going supernova.